October 15, 2010: One of our quick readers happened to catch this unfortunate delay on video yesterday on East Washington Ave in our own beloved Madison. We don't know what emergency the ambulance was dealing with, but we know they lost 7 minutes of their travel time waiting for this train! Watch the video here. September 27, 2010 UpFront with Vicki McKenna on AM-1310 WIBA- Click here to listen, or here to read more about the THRIVE report. August 10, 2010, New Geography.com- The Rich get trains and the Poor get their buses taken away! 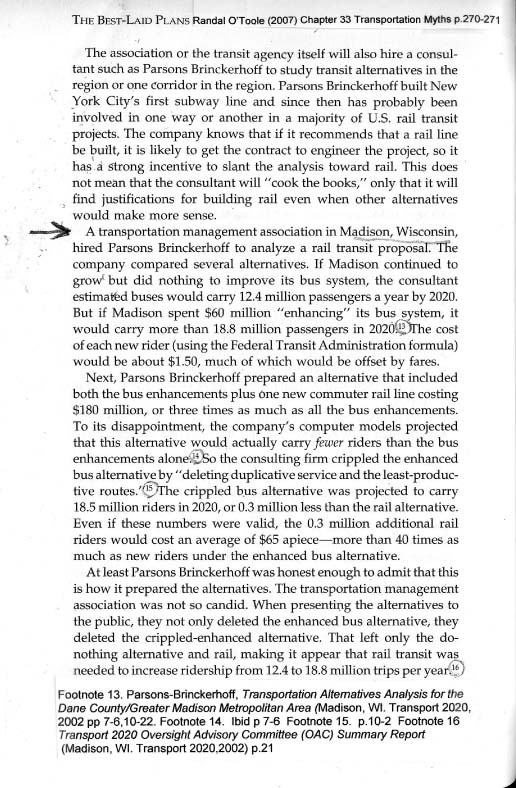 This analysis of commuter rail across the country by Joel Kotkin is called Mass Transit: The Great Train Robbery (no kidding, that's the article title!). Know of an event we should list? Let us know! read important articles we've amassed, check out some poignant pictures, and get involved! 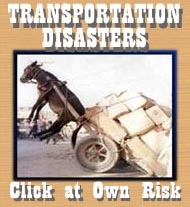 Email your representatives in local and state offices, and the Federal Transportation Agency. Our future is at stake! 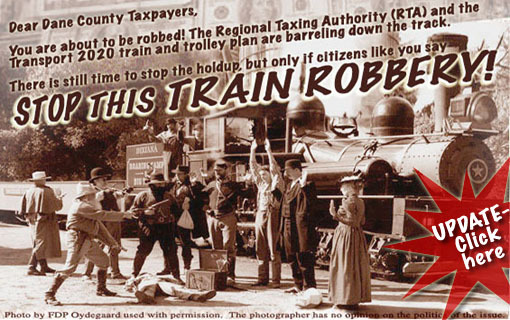 Let's inform enough people to stop this great train robbery in Dane County. Find out about upcoming events, network with others. Financial contributions will help us spread the word! Thanks for dropping by, and please tell a friend about us! 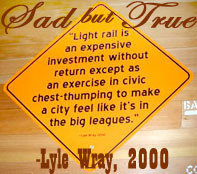 Site Sponsored by People for Sensible Transportation (PST!) Copyright © 2007. All rights reserved. Copyright © 2004–2019 by Thegreattrainrobbery.org. All rights reserved.